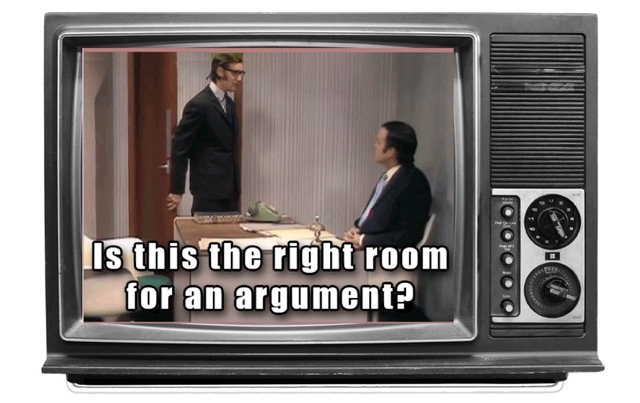 Excuse Me, Is this the Argument Room? - Credit Mediators Inc. Excuse Me, Is this the Argument Room? From time to time we at CMI receive an inquiry from a potential client with a heads up that their conversation with the customer got a little intense. In a recent inquiry, we were informed that after making several prior requests for payment, suddenly during the last request the customer became very angry and started shouting, even taking some personal shots at the creditor. Unfortunately, the creditor reacted to the attack by going on the offensive, which caused their heated exchange to shoot into the atmosphere. Needless to say, after the debtor abruptly hung up the phone, the creditor was beside himself. Sympathetically, I heard several things that appeared to transpire during this episode which I felt probably contributed to the debtor’s unexpected and continued outburst. As many of us may suddenly find ourselves on the end of a very angry customer call, here are a few thoughts I have tried to impart to our own collectors over the years that I think will help you to keep your head on, even when your past due customer may be losing theirs. It’s better to lose the battle (the argument) but ultimately win the war (getting paid). Since the goal is to get paid, it’s best to not let yourself get ensnared in an argument from the get-go. 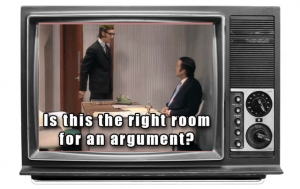 I remember many years ago when I used to watch Monty Python’s Flying Circus and there was a very funny skit in which a man knocks on the door to an office, walks in and says, ”Excuse me, is this argument room?” The snarky response by the person in the office was, “Yeah, it’s the argument room, so what!” and from there they engaged in a full blown ruckus. Once you hear that initial hostile utterance, take a deep breath and think about the long-term strategy of winning the get-paid war. Let the customer vent. Most times when a customer starts getting huffy puffy, it’s because they are aggravated about several things, and your call is the trigger that causes them to lose it. Unfortunately, you are the unlucky one to be the brunt of their frustration that day, especially since you’re calling them for money — a very stressful topic. But by letting them get the problems or complaints off of their chest, without any interruption, you are setting the stage for the next step of your communication strategy. Lower your voice and slow down the pace. You’ll know when the time is right to chime back in. As the customer rambles on for a long time without any interruptions from you, eventually he’ll hear himself talking and begin to wonder if you’re still listening. When he finally comes to the end and is waiting for your response, talk in a soft voice and speak at a pace that will convey a willingness to communicate gently. Throughout my extensive collection career, in almost all cases I have found that lowering my voice and speaking a little slower has moved the communication level back to normal. Say I’m sorry no matter who’s fault it is. Have you ever apologized to someone even though you didn’t do anything wrong (beside your spouse)? Most likely you were thinking, whatever it is that’s bothering them, I will apologize anyway so that we can put the anger and frustration to the side. By doing that you were able to concentrate on the main issue, rather than let the intensity of the communication railroad the call. In most cases, saying “I’m sorry” will allow the conversation to recalibrate, when you can again make your request for payment at the proper time. Steer away from points of contention. As you know, when it comes to collecting money, people make and break promises to pay all the time, sometimes going to great lengths, giving elaborate excuses as to why they couldn’t make their payment. If you assert that the other party is not being honest or is going around and around with excuses, the communication may come crashing down. So rather than focusing on what was or should have been, move forward and stay focused on when they can and will make their payment. Know when to hold’em and know when to fold’em. If the customer becomes abusive, let them calmly know that you would like to hear what they have to say and that you sincerely want to help them. However, if the abuse does not stop, let them know that you are going to end the conversation and then quietly hang-up the phone. By not engaging in any combative language, hopefully when you try to catch them a couple of days later, you will not have to feel concern for having said something out of line. As there are many other factors that could trigger someone to go off the deep end, the importance of keeping your cool during a very tense conversation can’t be overstated. After all, once the other side hangs up that phone, the collection opportunity, no matter who takes over, becomes significantly more difficult.